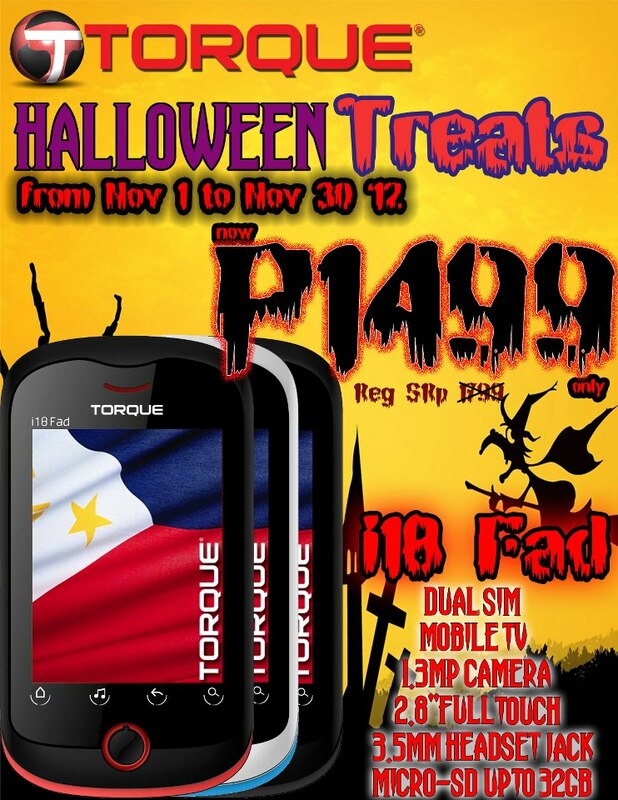 Home Gadgets News Torque Halloween Treats: Get the Torque i18 Fad Touch TV phone for only Php1,499! Torque Halloween Treats: Get the Torque i18 Fad Touch TV phone for only Php1,499! TORQUE just announced via their Facebook fan page their newest "Torque Halloween Treats" promo, where you can get the Torque i18 Fad Touch TV phone for only Php1,499! That's Php300 off from its original SRP of Php1,799. The i18 Fad is part of Torque's Media series, where you can watch TV on the move while navigating the screen with your fingers. The promo is now available nationwide at any Torque Concept Stores & Kiosks from November 1 until November 30, 2012 only. More about Torque i18 Fad specs after the jump.